The exhibition of twentieth century art from the Stirling Smith’s collection continues. Featured prominently is this work by Helen Flockhart, who graduated from Glasgow School of Art in 1985. Since then she has built a formidable reputation through numerous exhibitions in Britain, Europe and America. Her rich, meticulously crafted paintings are charged with an arresting power. It is a power that derives not merely from the extraordinarily detailed execution of each work but also from the idiosyncratic iconography that the artist has evolved. Flockhart’s pictures conjure up a vivid world, at once familiar and strange. Helen Flockhart’s work is held in numerous private, corporate and public collections, including the Gallery of Modern Art, Glasgow, Edinburgh City Arts Centre and the Fleming Collection of Scottish Art, London. 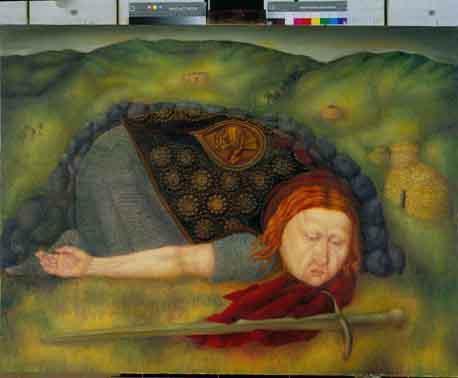 This work, titled ‘Legacy’ was a purchase prize entry in the Smith’s Brave Art exhibition of 1996, on the theme of William Wallace and the Battle of Stirling Bridge, 1297. A slain figure with the symbols of Wallace – the great sword and the winged dragon, which is usually represented as part of his helmet – is pictured as becoming a Celtic round house, like others on the landscape, suggesting that his story is a main building block of Scottish history. The exhibition runs until 14 August.